My multi-part series on Socialism in the Modern World has featured Venezuela, the Nordic nations, and Greece. But no discussion of dirigiste policy would be complete without a look at France. 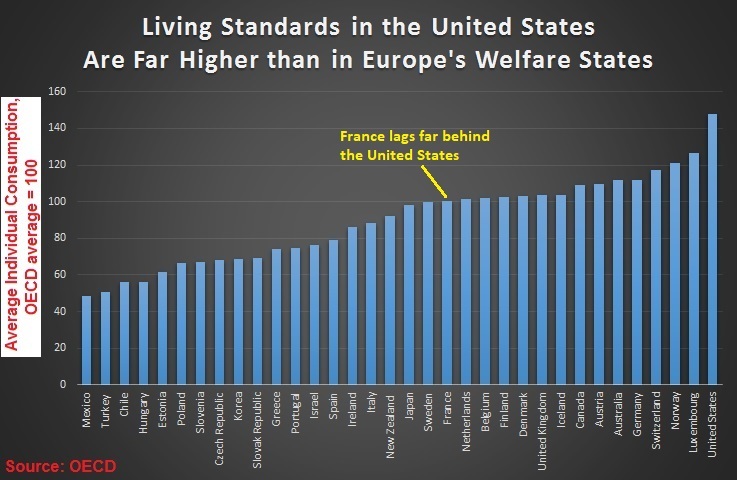 After all, not only does France have a history of imposing 100-percent-plus tax rates, it also hold the dubious honor of being Europe’s biggest welfare state. And it has the highest overall burden of government spending. These are not good numbers, especially when you consider the demographic changes that are happening in Europe. Sadly, there’s a long history of French statism. Andras Toth of the Carl Menger Institute explained some of the France’s grim economic history. If there is an example of a dirigiste, interventionist state, then that is France in Europe. France was the birthplace of the mercantilist, absolutist monarchy in the early modern period. …the practice of mercantilist protection and monopolization of key industries, including the state-mandated “industrial development policies” …Under the rule of the famous finance minister, Jean-Baptiste Colbert… France sank into a series of crises and lost her preeminent position in Europe. …The modern French state is the stepchild of the political culture of the Bourbons. It is the prime example of dirigisme. It redistributes as much as 56 percent of annual GDP and imposes the highest tax burden in Europe. The French state directly manages key industries and sustains one of the largest welfare states in Europe. It also imposes complicated bureaucratic red tape on economic actors, trailing way behind the Scandinavian states and Germany as far as ease of business is concerned. Though he also explains that the current president seems to understand that France needs less government and more economic freedom. Macron was the first French politician to build his election campaign on reform and competitiveness in order to keep up France’s position in the world. Those who voted for him knew what to expect. As a member of Hollande’s team, he proposed increasing the work week from 35 to 37 hours to lessen the tax burden on higher incomes, and the competitiveness package he developed aimed to lessen the protection of workers and companies in order to promote growth. …France is again at a crossroads: She has to choose between the policies of Jean-Baptiste Colbert and those of Anne-Robert-Jacques Turgot, the great French liberal economist who was the economic minister of France between 1774 and 1776 and who argued for free trade, less taxation, and less regulation. I also sympathize with what Macron is trying to achieve (at least with regard to domestic reforms). But I fear it may be too little and too late. Especially since the New York Times reports that Macron is increasingly unpopular. …attacks…that Mr. Macron is a self-seeking servant of society’s fortunate… The undisguised hostility has made clear that, less than a year into this new presidency, anti-Macron sentiment is emerging as a potent force. It is being fueled by a pervasive sense that Mr. Macron is pushing too far, too fast in too many areas — nicking at the benefits of pensioners and low earners, giving dollops to the well-off and slashing sacred worker privileges. Though he does deserve some of his unpopularity. He imposed green taxes late last year that triggered nationwide riots from motorists and other unhappy citizens. But he’s also unpopular for some of his good policies, which leads me to fear that France may be past the tipping point, meaning that genuine and meaningful reform no longer is possible because too many voters are on the government teat. I hope that’s not the case. France used to be one of the most wealthy and powerful nations in the world. But now its living standards are barely average according to the OECD’s AIC numbers. Because of the ongoing debate about what the term actually means, it’s unclear whether France’s tepid economic performance can be blamed on socialism. 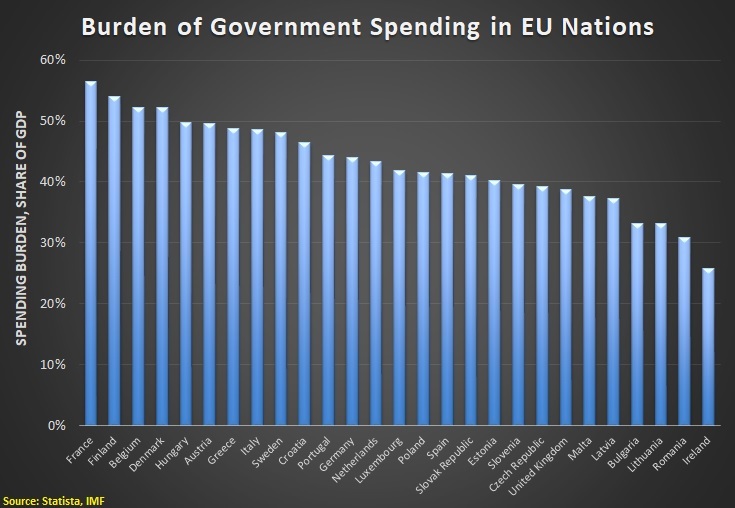 But we shouldn’t doubt that the country is paying a considerable price for having too much government. P.S. My favorite cartoon about French socialism actually features Barack Obama. P.P.S. One of the world’s greatest economists was French, but politicians in France obviously ignored Bastiat just like they ignored Turgot. In last year’s French presidential election between Emmanuel Macron and Marine Le Pen, I joked that voters should choose the socialist over the socialist, but made a serious point that Macron – despite having been part of Hollande’s disastrous government – was preferable since there was at least a hope of market-oriented reform. …the chance of Macron being good are greater than zero. After all, it was the left-wing parties that started the process of pro-market reforms in Australia and New Zealand. And it was a Social Democrat government in Germany that enacted the labor-market reforms that have been so beneficial for that nation. And after Macron won the election, I reviewed some of his initiatives to restrain government, including plans to reduce the burden of government spending, lower France’s corporate tax rate, and to shrink the size of the bureaucracy. We’re not quite to the one-year anniversary of his election, but let’s take a look at Macron’s track record. And we’ll start with a very encouraging report from the New York Times. …if France’s young president, Emmanuel Macron, has made one thing clear, it is that he is not afraid to shake up France and take on its venerable institutions. Now it is the turn of the heavily subsidized and deeply indebted French rail system. Mr. Macron says he wants to erase the railway workers’ special status, which gives them more generous benefits than almost any other workers, including a guarantee of early retirement. In doing so, he has set himself a new and formidable challenge in his expanding campaign to reshape France’s society and economy, which started last year with a law that made it easier for private companies to hire and fire workers, a near revolution for France. Macron has a difficult task. …the railway workers are a public-sector work force, one of the most powerful in the country, with a chokehold on as many as five million riders daily. When they go on strike, the whole country feels it. …rail unions have already pledged to join a strike by public-sector employees planned for Thursday… The rail workers then plan weeks of strikes starting in April that will be staged on a rolling basis. Here’s some of what Macron wants to fix. French rail workers’ current, ample benefits — including in some cases, the option of retiring at 52 — date to the first half of the 20th century, when many railway jobs involved hard, physical labor… Mr. Macron…to push for a broader overhaul that, for new hires, would end advantages like guaranteed jobs, automatic pay raises and generous social security benefits. …The French rail system is both heavily subsidized and deeply in debt, to the tune of 55 billion euros, or about $68 billion. And if the French President succeeds, there are other reforms on the horizon. Mr. Macron has pledged to follow the railway plan with an overhaul of the unemployment system later in the year. Next year he intends to take on the French pension system. …changing the employment terms for railway workers appears to be part of a larger crusade to push French workers into the 21st century. Good. Similar reforms were very beneficial for German workers and the German economy, so I’m sure Macron’s proposals will produce good results in France. Writing last October for CapX, Diego Zuluaga expressed optimism about Macron’s agenda. …it is the French government that is tackling the big barriers to growth and dynamism that have stifled their economy since 1975. …Emmanuel Macron…has vowed to attack this status quo. He aims to deconstruct the onerous French labour market law, the infamous Code du travail. This is a 1,600-page, 10,000-article gargantuan piece of legislation which is blamed for clobbering employment in France over the past 25 years. …Macron may be able to deliver considerable reforms when it comes to the labour market. His cabinet intends to move a larger share of collective bargaining to the firm level, remove the requirement of union representation for small- and medium-sized businesses, limit severance pay – right now it averages €24,000 per dismissal – to give employers greater certainty about the costs of hiring… Spain reformed its dysfunctional hiring and firing regulations in 2012, and robust employment growth followed. Now, it is long-ossified France that is taking up the baton. If you stopped reading at this point, you might conclude that Macron is a French version of Ronald Reagan or Margaret Thatcher. But that would be a considerable exaggeration. The French President also is pushing some questionable policies, such as higher taxes on luxury goods. But, in Macron’s defense, those class-warfare taxes are an offset for the abolition of the wealth tax, which was a very good reform. Emmanuel Macron’s administration will propose a tax on luxury yachts, supercars and precious metals in France’s 2018 budget. Lawmakers will propose amendments after critics attacked the President’s move to scrap the wealth tax in France. Mr Macron abolished the tax, which has been seen as a symbol of social justice for the left but blamed by others for driving thousands of millionaires abroad. …The wealth tax, introduced by the Socialists in the 1980s, was levied on individuals with assets above 1.3 million euros (£1.2 million). Since I’m not familiar with the details (i.e., do these changes result in a revenue-neutral shift, a net tax cut, or a net tax increase? ), there’s no way to determine if swapping the wealth tax for luxury taxes is a net positive or a negative. Though I assume the overall effect is positive because wealth taxes are a very bad idea and luxury taxes, while self-destructive, generally are futile. But this doesn’t let Macron off the hook. Even if we decide that he’s a pro-market reformer inside his country, he has a very bad habit of promoting statism at the European level. The Wall Street Journal opined unfavorably last year on his plan for greater centralization. …the French President issued a call for more, more and more Europe. …His EU would be responsible for many of the functions traditionally performed by a nation-state, such as defense, taxation, migration control and economic regulation. …The problem is…Mr. Macron’s dreams of fiscal and economic union. He wants to create an EU finance ministry, funded by corporate and other taxes, that can spend money across the bloc with minimal interference from national capitals. Mr. Macron also wants to harmonize—eurospeak for raise—corporate taxes across the EU. He’d further establish Franco-German regulatory excess as the benchmark for the rest of the EU… This is a recipe for political failure because Europeans already know these policies are economic duds. Writing for the New York Times, a German journalist poured cold water on Macron’s plan to give redistribution powers to the European Union. It would be funny if it weren’t dangerous — the solution offered by the new, pro-Europe president, Emmanuel Macron, is to create a eurozone budget, with its own finance minister. …Mr. Macron’s proposal is a disaster in the making. It will only further alienate Europeans from one another and weaken the bloc economically. …Brussels’s money has often been Europe’s curse. The Greek government, for instance, knew it could take for granted the support of the other euro members for its unsustainable budget after Chancellor Angela Merkel of Germany recklessly declared, “If the euro fails, Europe fails.” Athens slowed down on reform, knowing Brussels would bail it out, and northern Europeans grew angry. In the worst case, Mr. Macron’s plan could turn this disincentive into a characteristic feature of the European Union. …Brussels would end up holding the purse but not the purse strings. So what’s the story with Macron’s schizophrenic approach? Why is he a pro-market Dr. Jekyll for French policy but a statist Mr. Hyde for European policy? I don’t have the answer, but Diego Zuluaga wrote about this dichotomy for CapX. The puzzle of Macronism is that it tends to advocate dynamism at home, but stasis abroad. The French President, both during his tenure in Hollande’s cabinet and in his new office, has championed reform of the country’s bewilderingly byzantine employment code, which has promoted social exclusion and led to a high rate of structural unemployment. …But Macron’s liberalism seemingly stops at France’s borders. On the EU level, he has called for increased risk-sharing among euro member states, a eurozone budget and finance minister… Whatever one makes of his climate-change activism, it is nothing if not dirigiste in the extreme, wishing to curb carbon emissions through bureaucratic pacts on a global level. What we are left with is the pro-market equivalent of Stalin’s pre-WWII economic policy of “socialism in one country”. Liberalism in one country acknowledges the need for economic flexibility and a greater reliance on market forces at home. It champions tax reform and deregulation of industry and hiring. But it shuns those principles on the international level. By the way, Mr. Zuluaga is using “liberalism” in the classic sense, meaning pro-market policies. Let’s close with a couple of items that show France still has a long way to go. First, a leftist columnist wants us to believe that recent riots, caused by a sale on Nutella, are symbolic of a dystopian future. You may have seen the videos: in French supermarkets Intermarché, customers are rushing towards shelves of Nutella jars. They’re running, shouting, fighting, rummaging to grab a jar of the chocolate flavoured paste… This mess happened simultaneously in various French supermarkets when grocery chain Intermarché advertised a massive sale on 1kg Nutella jars, priced at €1,41 instead of the usual €4,50. …I don’t find this news funny, not even remotely. 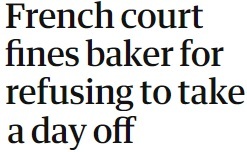 …it is telling of a France that is more and more divided… The massive response to this sale shines light…on the precarious position in which many French workers, and shoppers, find themselves. …And it’s not going to get any better for them. Macron’s looming labour reform is already eroding French workers’ rights… Macron’s great vision for France increasingly looks like a country where only the rich and “successful” will be able to afford Nutella – and those who “are nothing” will be left to fight for sale prices. This type of over-wrought analysis makes me want to cheer for Macron. Why? Because I understand that the best hope for workers is faster growth, not “labor-protection policies” that actually undermine job creation and cause wages to stagnate. Second, we have a story that highlights the impossible regulatory burden in France. The bottom line is that Macron should drop his statist European-wide proposals and put all of his focus on fixing France. 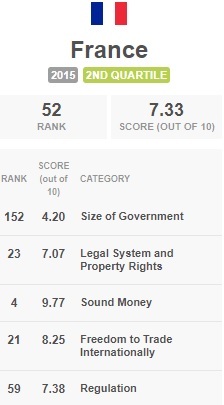 If you look at his country’s scores from Economic Freedom of the World, he should be working day and night to reduce the fiscal burden of government. And lowering the regulatory burden should be the second-most important priority. P.S. If the numbers in this poll are still accurate, Macron better fix his nation’s bad policies or his productive citizens will escape to America. After all, France is a great place to live if you’re already rich, but not so good if you aspire to become rich. P.P.S. Here’s a story highlighting the lavish government-financed benefits for the privileged class in France. P.P.P.S. My favorite French-themed cartoon features Obama and Hollande.